…is very, very late in arriving. 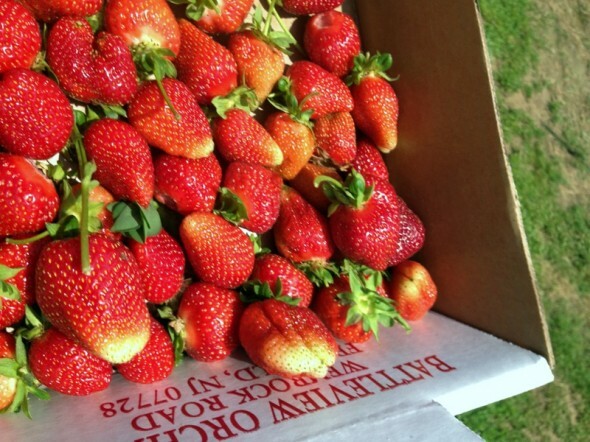 I know, strawberry season has been over for 2 months in NJ. But, it was a great season around here, and there are always frozen strawberries (which I am seriously considering for one of the amazing jams I made too little of). So, this is what we did this year. Well, first we had to pick the berries. We met up with Montessori friends at Battleview Orchards the day after school ended for the summer. 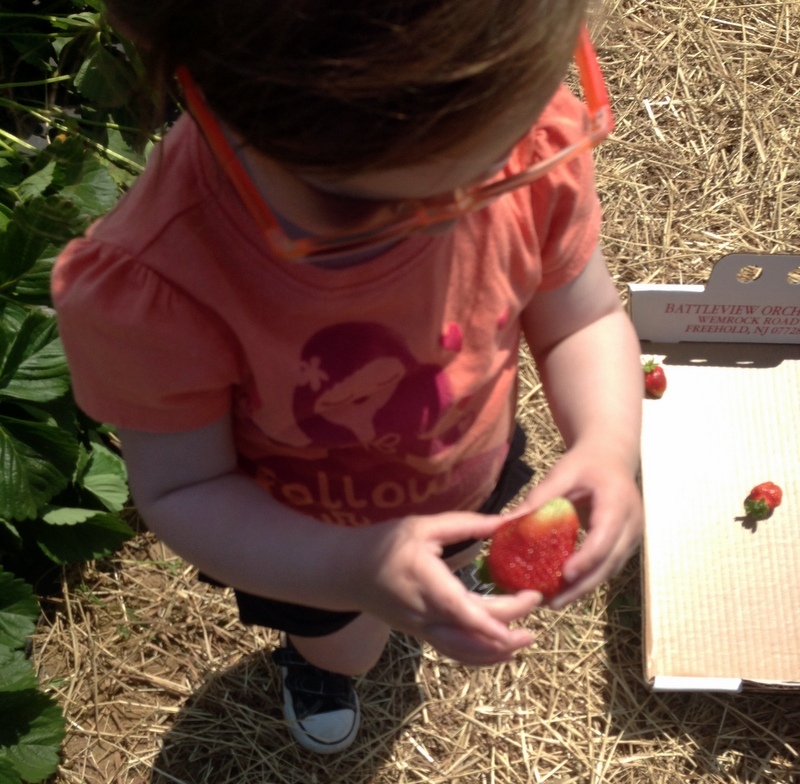 I got two photos of H picking berries before she stopped and ran through the strawberry patch instead. Then it was getting hot, and she just made it known that she no longer wanted to be there. 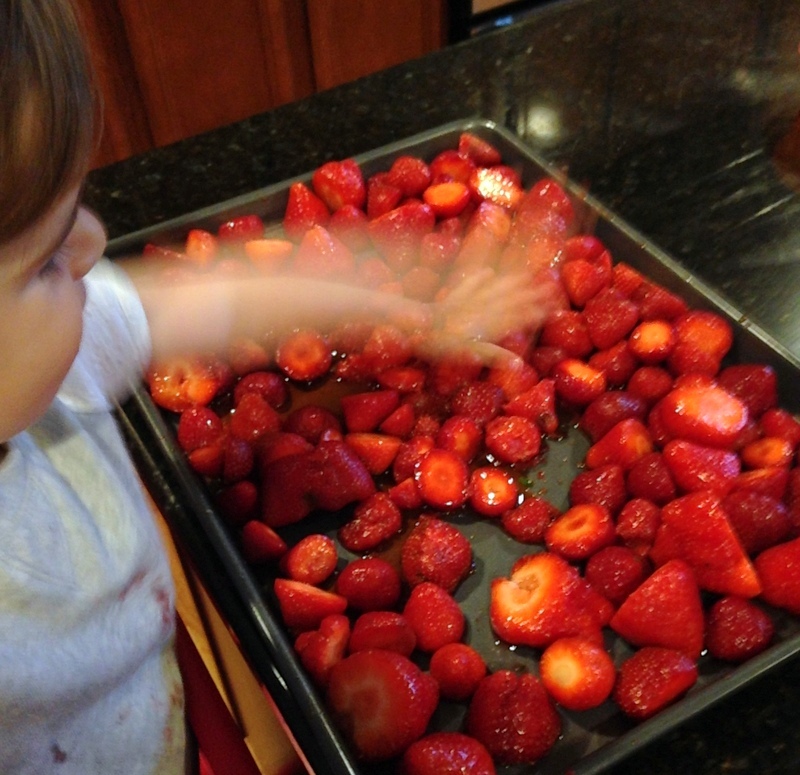 I did manage to get plenty of fruit, though, with the capable help of almost-five-year-old Charlie. 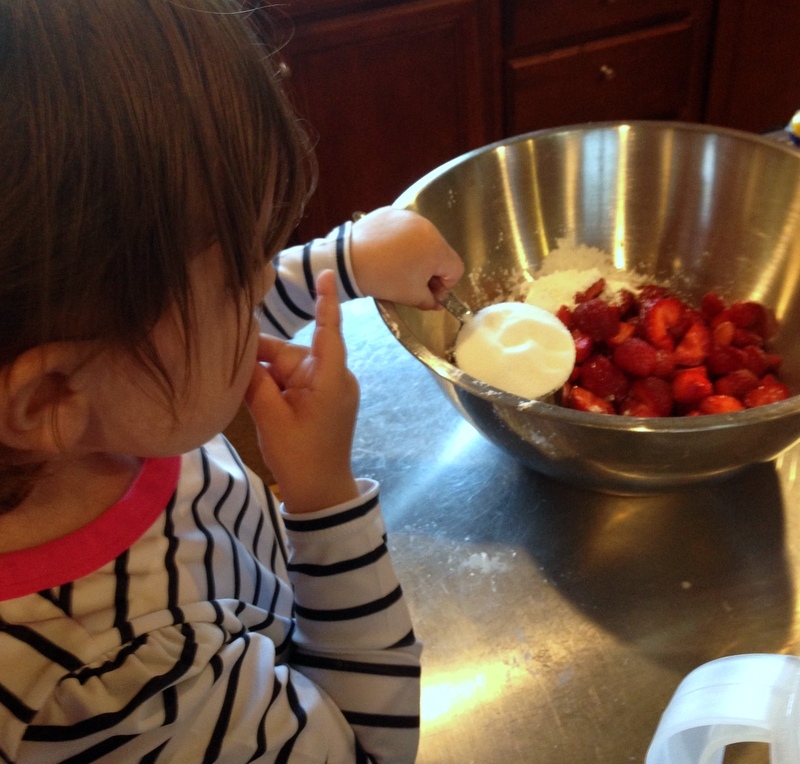 H was much more interested in making pie a few days later with the strawberries. 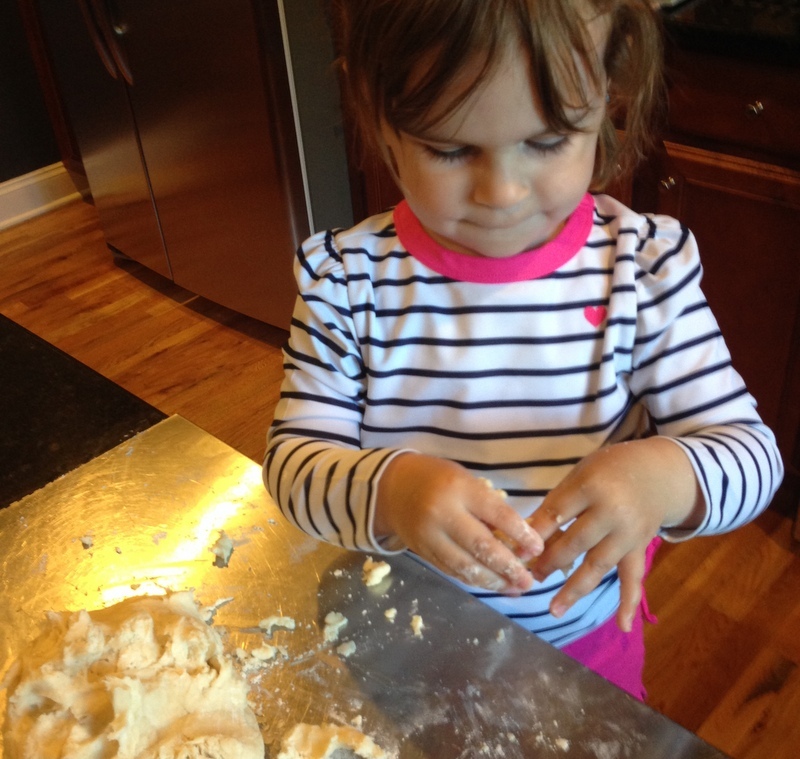 She’s a pretty good masher. And just an overall great pie maker. 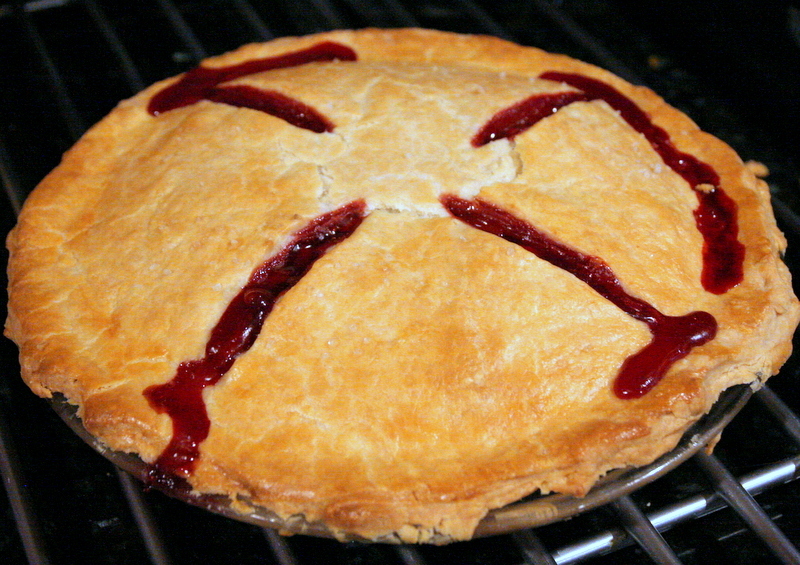 Straight strawberry pie (no rhubarb!). Still my favorite. I didn’t make strawberry jam last year because we still had some, but this year I made two kinds. I used way less sugar than my last recipe, and I added herbs. I’m getting the hang of this jam thing, I cannot stop eating this year’s concoctions. This first one above is the Strawberry with Vanilla and Basil Jam that I made. For all of my jam so far this year, I followed the basic recipe on the Pomona’s Universal Pectin box (Jam On seems to almost exclusively use this pectin, which I had on hand but switched up with other gelling options). I just tweaked it for the number of jars I was making, and I slowly added organic sugar until the jam was the right consistency to set and no more (this was slightly less than the box recipe, in the end). First sanitize the jars and set aside. There are a million directions for this out there, and the Pomona box also includes them. I run the jars through the dishwasher then let them sit in the canning bath while it boils and I made the jam. Put the calcium water into a large pot. Mix the pectin and the sugar together in a bowl until well incorporated. Add the mashed strawberries and lemon juice to the pot and bring to a boil, stirring well. When the fruit is boiling, add the vanilla and basil and stir. Bring it back to a boil if it slows down and slowly add the sugar/pectin mix. Stir constantly for 1-2 minutes until the mixture is dissolved. Bring it up to a boil once more, then do the teaspoon test: take a teaspoon from the freezer and, using whatever you were stirring with, put a blob of jam on the frozen spoon. 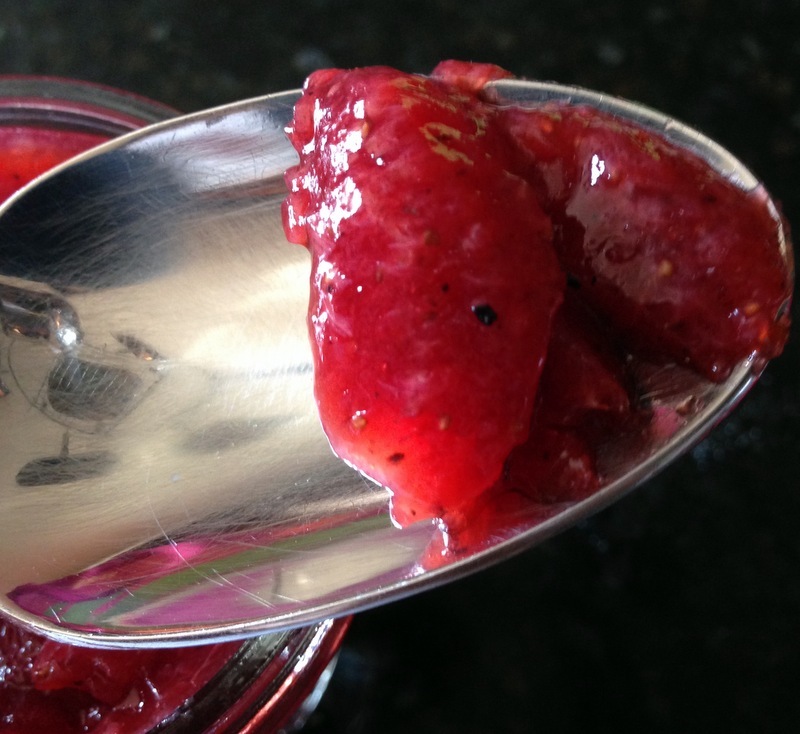 When the spoon gets to room temperature, if the jam slowly slides on the spoon like jam, it’s gelled. If it’s too liquid, cook a bit longer and decide whether to add more pectin and sugar. Turn off the heat and skim any foam off the top (the foam is actually kind of an awesome snack when it cools down). Fill the jars to 1/4″ from the top, wipe the rims with a wet paper towel, seal, and process for 10 minutes in a hot water bath. Let the jars cool completely to make sure the lids pop and the jars are properly sealed. **If the lids don’t pop within a few minutes, I have in the past opened them immediately, cleaned the rims again, resealed, and dunked them back in the processing pot for another try. The recipe I’m the most proud of this summer is actually this second one, which has become sort of amazingly addictive to me. 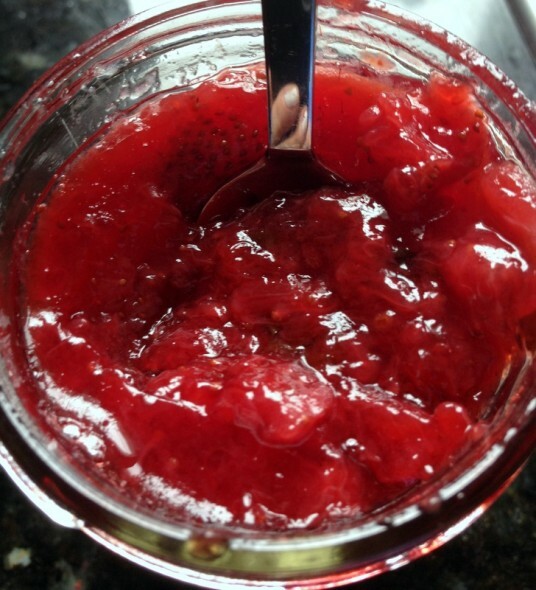 Strawberry jam with honey and black pepper. I was looking on a bunch of cocktail websites to see what kind of flavor pairings were out there for fruit, and I found some really interesting ones. Apparently strawberries with black pepper are a thing. But now I can’t get enough; I didn’t make enough. I only got 5 jars out of this batch. Big lesson learned; I used the same 9 cups of mashed fruit as I did with the first recipe, but I let these berries macerate with sugar overnight–at this point I cannot for the life of me remember why. Experimenting, probably. They totally broke down into mush, and I ended up buying more strawberries to yield even 5 half-pint jars. The texture of the two jams are totally different; the first is clearer and chunkier, the second is smoother and more opaque (the honey probably has something to do with that). But the flavor, holy cow. The spicy finish from the pepper, which you don’t taste at first, is just incredible. 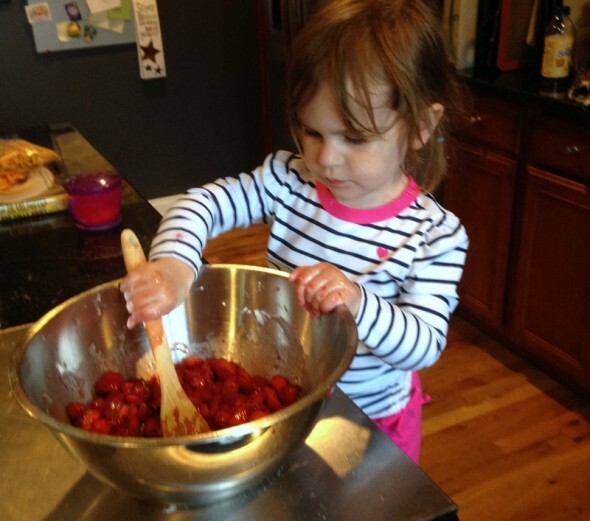 So here’s exactly what I did, and next time I will have to clean up this recipe and figure out why the yield was so much lower: I macerated 9 cups of mashed berries with 1 cup of sugar overnight. 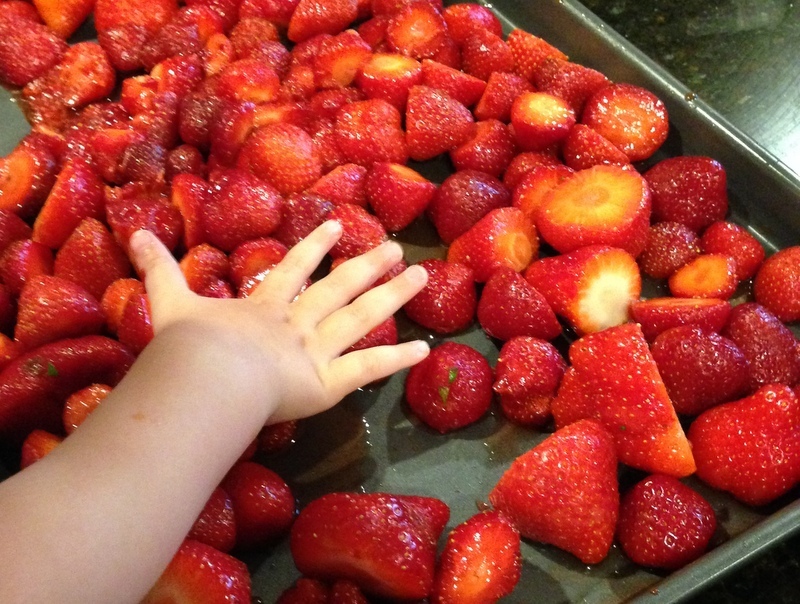 It was so mushy that I scooped out a scant 3 cups of that mixture and added it to 6 new, fresh cups of mashed strawberries. Then I proceeded the same way as I did with the first batch. I put the calcium water in the pan, added the fruit an lemon juice, and brought it to a boil. Meanwhile, I mixed the honey and pectin together. When the fruit boiled, I added the black pepper and a pinch of salt, stirred, and made sure it was boiling again. Then I added the honey and pectin mix, boiled it for another couple of minutes, did the frozen spoon test a couple of times until it worked, and I filled and processed my jars. So, a pie and two flavors of jam. 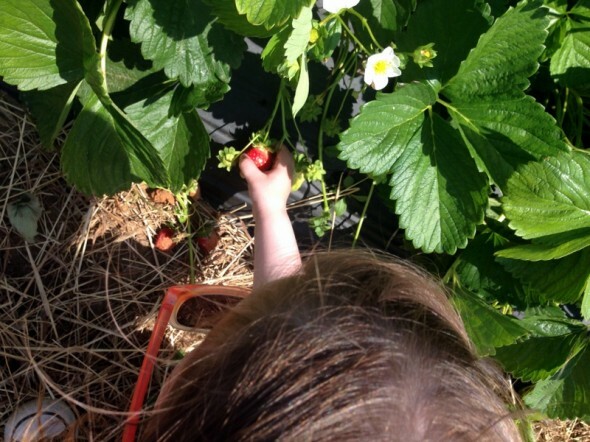 Plus outside time in a strawberry patch! Not a bad outcome this year.